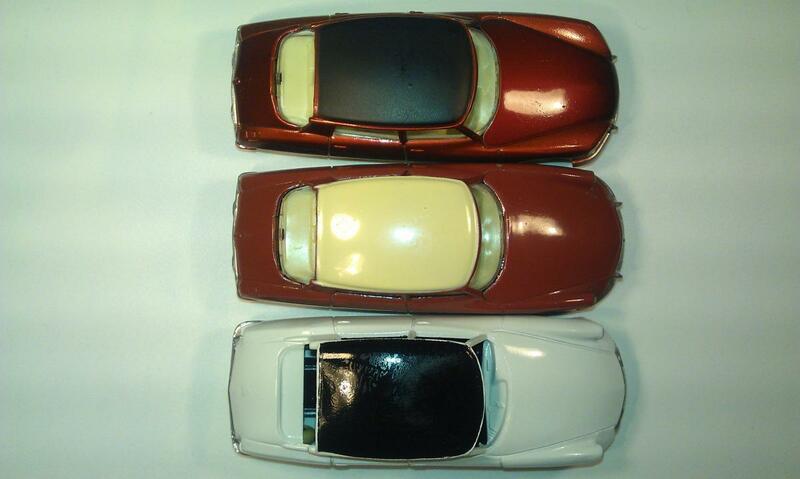 This is a presentation in pictures of the Dinky Toys 24 C Citroën DS 19 till 530 Citroën DS 19 and DS 23. It covers the whole range of Dinky Toys Citroën DS Berline from 1956 – 1978 in one topic (not the DS 19 Break and DS Présidentielle). It was issued in the sales numbers: 24 C, 24 CP, 522 and 530. The Citroën DS 19 is a very beautiful car. A real eye catcher on the road. In French you should say: Une voiture très élégante. It is revolutionary in design and technical aspects. There is a lot to say about the total development of design and technical model specifications through the years of the real Citroën DS but I leave that to others. I start with pictures of the first introduction of the Citroën DS 19 on 6 October 1955 in Auto Salon Paris. Many years of development went to the original concept in advance. The whole car world looked forward to the presentation of this revolutionary Citroën DS 19 and of course the photographic Press was there. The photographic Press around the introduction of the Citroën DS 19 on 6 October 1955 Auto Salon Paris. Auto salon Paris October 1955 introduction Citroën DS 19 on a rotating platform. The 1st Citroën DS 19 1956 on the road. Note: Had not yet exterior mirrors. The 1st Citroën DS 19 1956. Note the smoke plume from the exhaust of the running engine to hold the position of the Hydro pneumatic suspension. Hydro pneumatic suspension: Blue: Nitrogen gas; Gold: Hydraulic fluid under pressure from engine-driven pump. 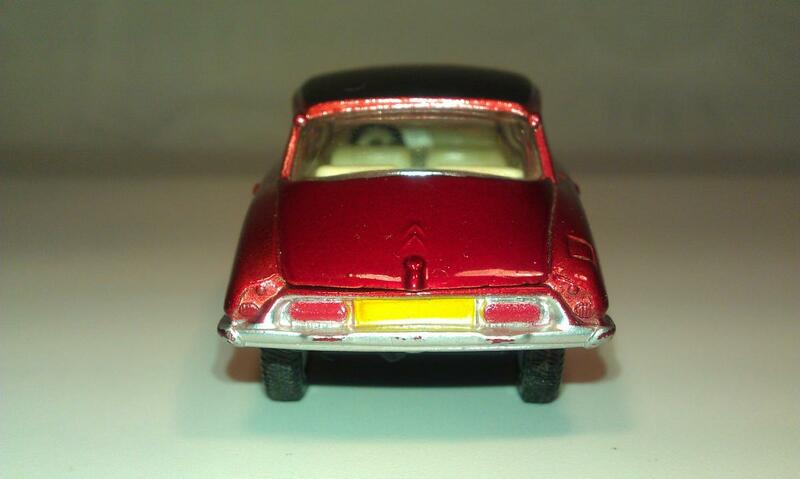 Impatiently awaited and demanded by the collectors, the Citroën DS 19 sees the day in the series of "Dinky Toys". Its undeniable success will compensate for the delay that technical problems have brought to the release date. Now she's at your toy store, you can ask her. The very special look of this revolutionary car is remarkably reproduced. Equipped with chrome wheels and white tires, the DS 19 comes in two colors: ivory, eggplant roof, and green, ivory roof (these are the Citroën series shades). It is equipped with a dashboard and a rear track. The finest details are faithfully rendered: fineness of the windscreen posts, trumpets of the flashing lights, curve of the front bumper ...., etc. In the Dinky Toys collection, the DS 19 bears the reference 24 C. It is reproduced at 1/43, which gives it an overall length of 112 mm. 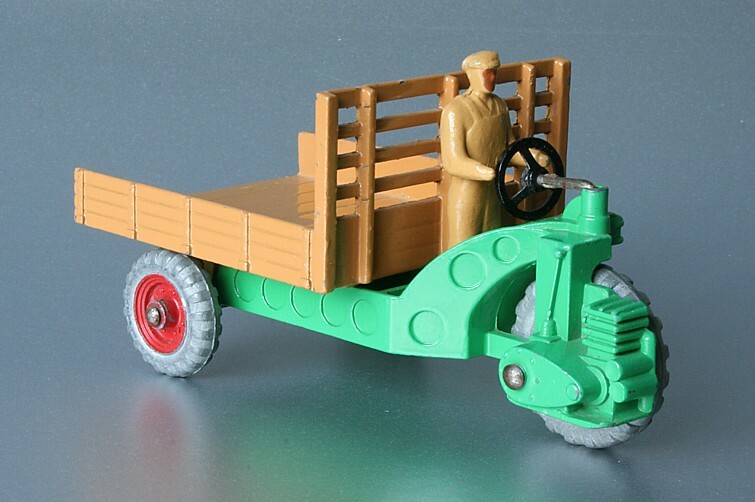 1) Question: Can anyone something tell about these technical problems to the release date of Dinky Toys model 24 C? I wanted to have a first and a last issue of the Dinky Toys Citroën DS 19, so I acquired a DT 24 C first issue without windows and a last issue of DT 530 with windows, opening boot and bonnet. To illustrate the struggle for live of the Dinky Toys Meccano France brand I also acquired a DT 530 Citroën DS 23 made in Spain by Auto-Pilen in the period 1976-1978. This is a very beautiful car with double silver glittering headlights, black grooved Dunlop tires, red metallic paint, black matt roof, cream interior and black steering wheel. A beauty on display. I show pictures of the Dinky Toys models with their various boxes and how they are pictured in the various catalogues. My Dinky Toys 24 C Citroën DS 19 without windows. (11/1956-1957). Dinky Toys 24 C Citroën DS 19 without windows. Dinky Toys 24 C Citroën DS 19 without windows. Note the new feature: open dashboard with Citroën chevron and the open hats shelf. 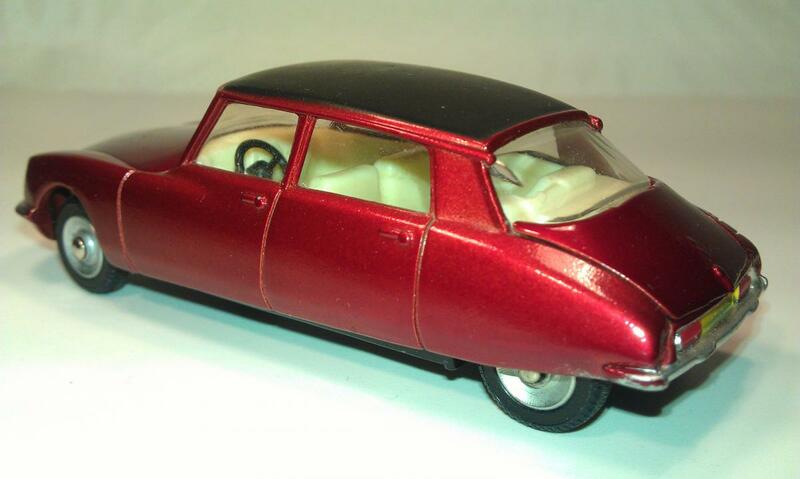 Dinky Toys 24 CP Citroën DS 19 “avec pare-brise, lunette et glaces”. (1958-1959). Photo by courtesy of Vectis. 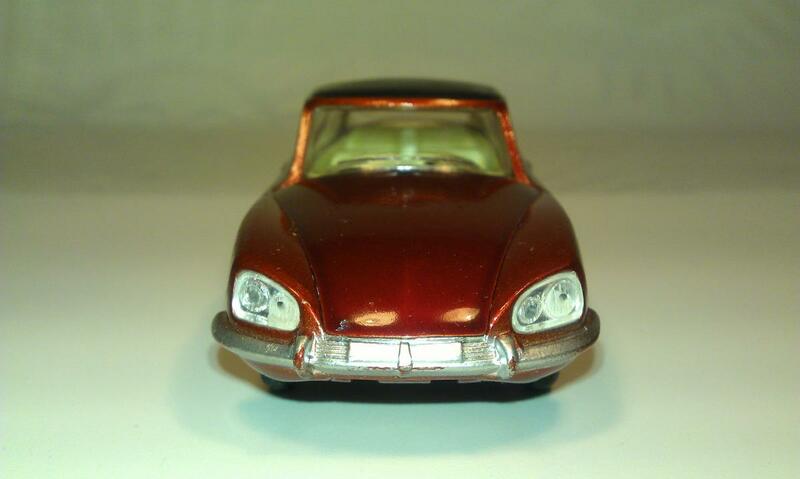 Dinky Toys 522-24 CP Citroën DS 19 “avec glaces”. (1959). Ebay picture. Dinky Toys 522 Citroën DS 19 “avec glaces”. (1959-1968). Ebay picture. Base plate Dinky Toys 522 Citroën DS 19 avec glaces. Has still 24 C in the base. Ebay picture. Note: Up till now, always "Citroën DS 19" on the boxes, but "DS 19 Citroën" in the catalogues. Citroën DS 19 1963 with new bumpers in front. Très gracieux. My Dinky Toys 530 Citroën DS 19 with new bumpers in front, windows, opening boot and bonnet, detailed engine and spare wheel, suspension, interior and steering wheel. (1964-1970). Note: From now on DS 19 Citroën or DS 23 Citroën on the 530 boxes. 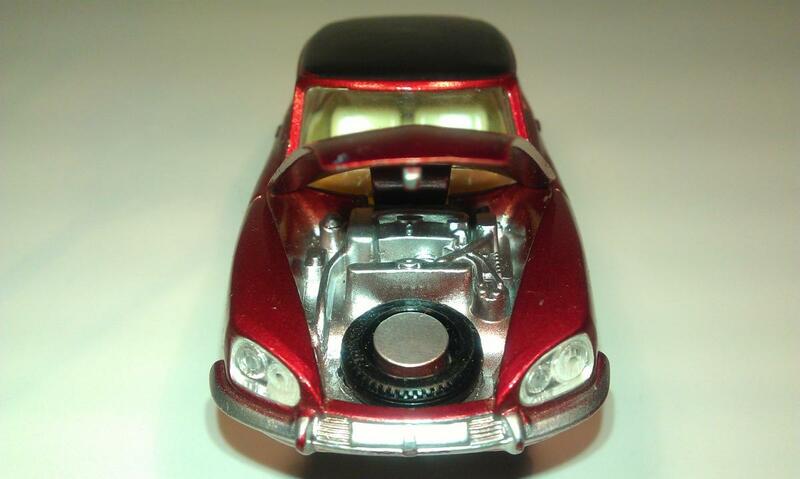 Dinky Toys 530 Citroën DS 19. (1964-1970). 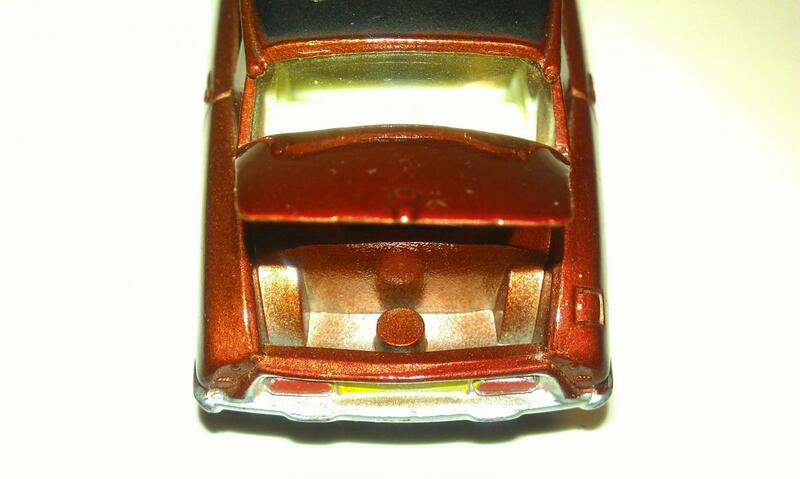 Base plate Dinky Toys 530 Citroën DS 19. 530 in base. (1964-1970). Note the text: "A Meccano Product. Made in England" at the top left of the box. How is that possible? The 530 Citroën Ds 19 were made in France!! 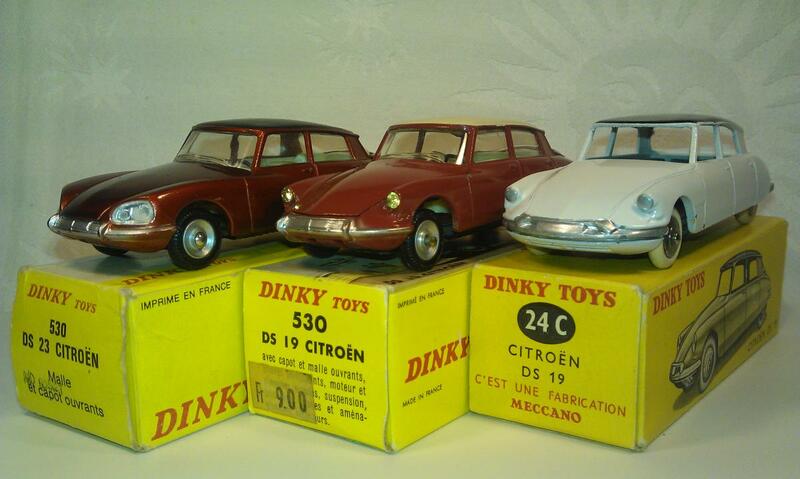 1) Dinky Toys 530 Citroën DS 19 (made in France and assembled in Spain) sold by Poch in Spain in 2 colours with Dinky Toys Poch Meccano on the box (1968-1970). 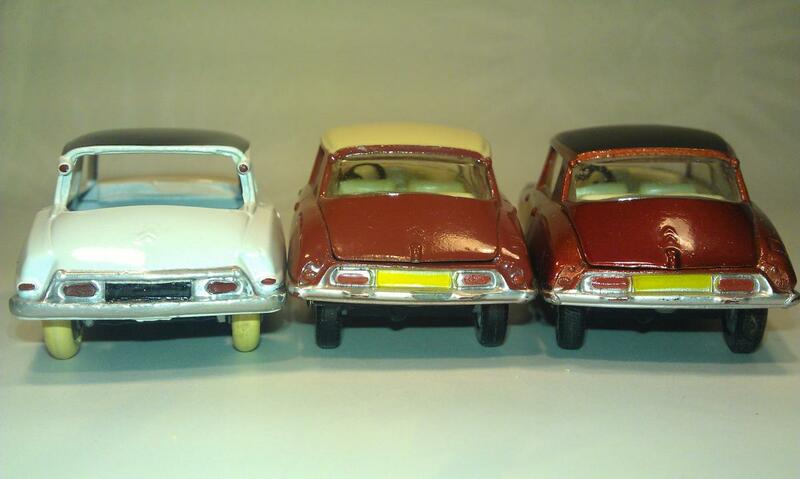 2) Dinky Toys 530 Citroën DS 23 made in Spain by Auto-Pilen (1976-1978). 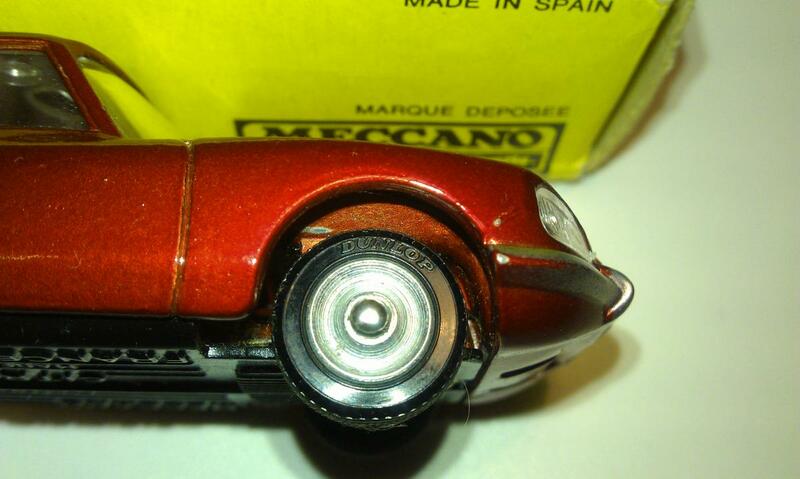 Dinky Toys 530 Citroën DS 19 sold by Poch in Spain in 2 colours with Dinky Toys Poch Meccano on box. (1968-1970). 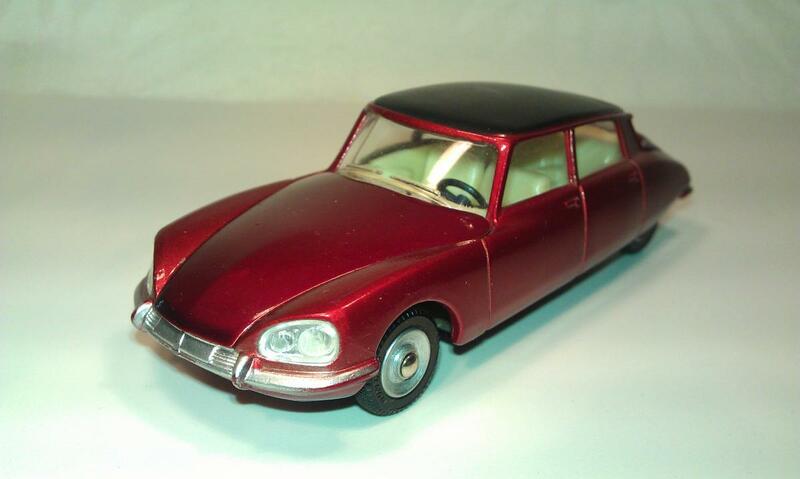 Dinky Toys 530 Citroën DS 19 sold by Poch in Spain. Ebay Fr bboldtoys € 3000. 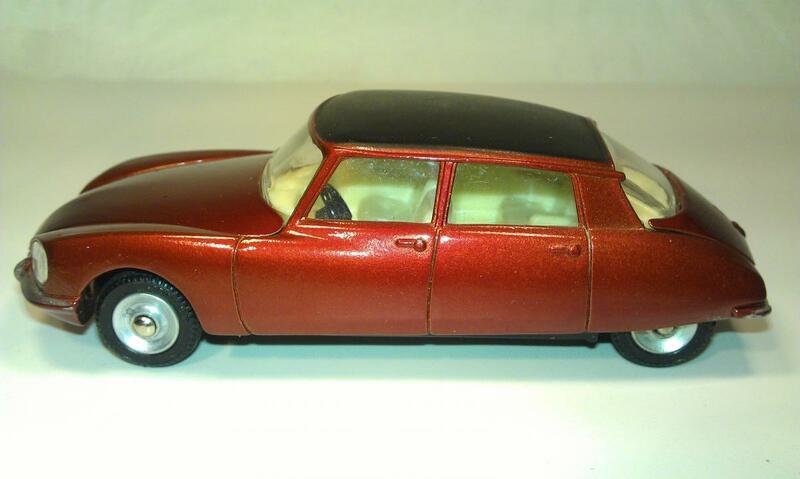 Base plate Dinky Toys 530 Citroën DS 19 – assembled and sold by Poch in Spain – not marked made in Spain. Dinky Toys 530 Citroën DS 23 in Général Meccano Catalogue France 1974. My Dinky Toys 530 Citroën DS 23 - New front with double headlights – made by Auto-Pilen in Spain and marked “made in Spain” on the base plate. (1976-1978). Purchased by the previous owner in 1977 in Paris. Real Citroën DS 23 Pallas 1973. The summum of comfort. 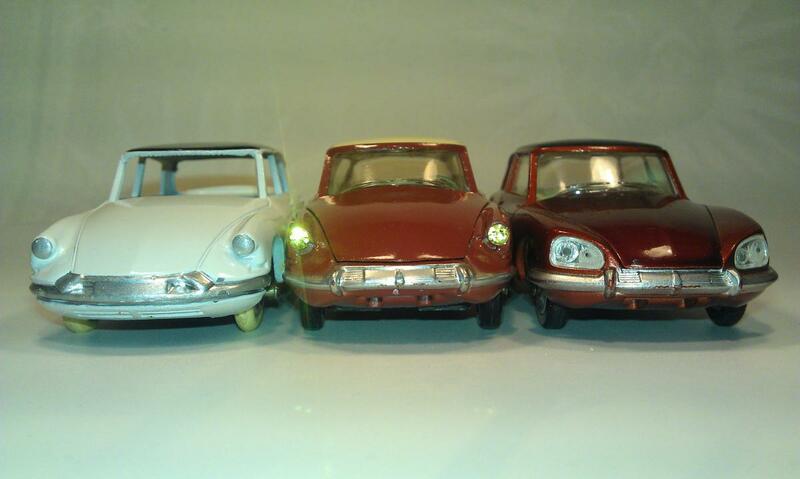 My Dinky Toys 530 Citroën DS 23 - New front with double headlights - marked “made in Spain”. (1976-1978). Dinky Toys 530 Citroën DS 23 box with “Made in Spain” and “Meccano Marque Deposee” on the box. Dinky Toys 530 Citroën DS 23 box with details about the engine. Base plate Dinky Toys 530 Citroën DS 23 with “made in Spain” on the base plate. 2) Question: How do members-collectors think about the Spanish issues. Do they regard them as real Dinky Toys, such as the South African issues for instance? Jean-Michel Roulet discusses in his book the 530 Citroën DS 19 sold by Poch in Spain, but not the 530 Citroën DS 23 made by Auto-Pilen in Spain, while this model also carry the Dinky Toys Meccano France brand on the base plate. As you can see on my pictures is this car also a very beautiful model with a beautiful bright colour scheme and very good shape and quality. He only lists 530 Citroën DS 23 in the table of sales numbers. Ramsay’s model toys catalogue 15th edition lists both, the 530 Citroën DS 19 sold by Poch in Spain and the 530 Citroën DS 23 made by Auto-Pilen in Spain in the list of French Dinky Toys cars. Poster of the Citroën DS 23 Pallas 1973. The summum of comfort. (By courtesy of ikonoto.com). 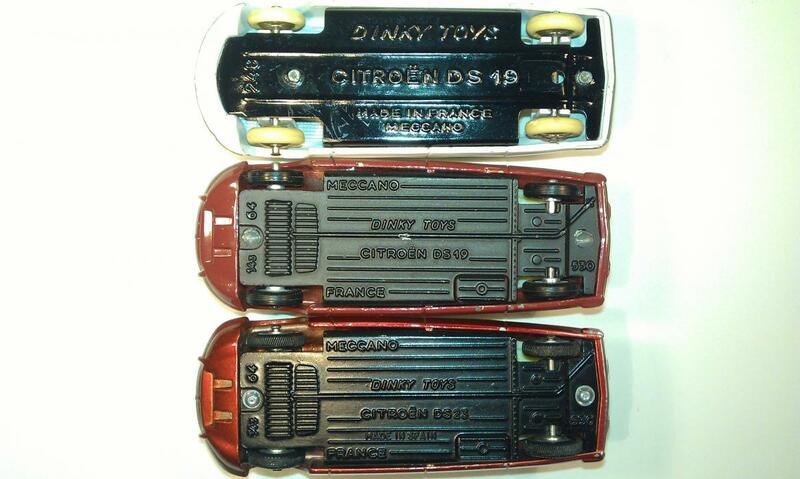 I am very happy to possess these very nice pieces of the history of Dinky Toys Meccano France. I'll continue my presentation with some full size photos. 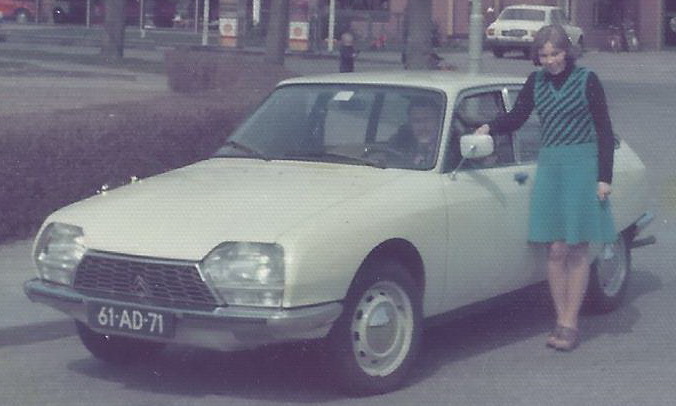 At the end I show my Citroën GS in my possession from 1973-1978. That was also a very nice and comfortable car. Collecting 'the ones without windows' only I do not have to worry about obtaining the later Dinky renditions . You found nice examples of those, which makes the Dinky coverage complete. Very nice revue of this fabulous car, a real experiance in driving. Just a little thing, the last picture in your post is of a Citroën GS, not DS. Of course Jacques. You are absolutely right. It's a GS, as described. A DS was a little bit too expensive for me. But the driving comfort of a GS is no less than a DS. You also experienced that driving comfort. Many thanks for your nice comment and I am also happy with your other contributions. Just another nice picture, with a black background, taken this afternoon! Hi Jan. Because you place a second photo with a dark instead of a light background, I assume that you are experimenting with the color of the background and I assume that you want to hear an opinion about it. My first thought was that you with a tool from your photo program you changed the background. My photo program ACDSee Pro 6 can not do that in my opinion. But if I compare well, that is not the case. You really made a second photo. The position of the box is slightly different. Personally, I like the white background better, because I see more depth in it and the contours of the Citroën look better. With the black background, the black roof, the interior and the underside of the car do not stand out. You do not see a depth in the photo. You can not look through the car. All photos of Vectis, for example, are taken with a white background and personally I think that is the best and the most comfortable. A black background is very hard to see. I do not like to see an archive of pictures with a black background. That's my opinion. Hello Jan, thanks for commenting! Please, do not consider this picture as meant to be 'documentary'. It is just one of those experiments when taking a new range of pictures of my Dinky Toys. I like it aesthetically, with the bright model and box against the dark background, but of course a more neutral background would produce a more 'objective' photo for assessing the model. Hello Jan. I understand your reasoning. You have often used grey as a background (see accompanying image from TMT). Is also a neutral color with which the contours also appear clearer than white. As you say, it also depends on the color combination of the subject. Because of your experience with photography over the years, it has become an adventure for you to experiment with the background that you personally find the best. That is the nice challenge of shooting.